Mama Mia, we have tomatoes! Somehow in spite of our disastrous attempt at starting tomato plants from seeds and the less than favorable weather conditions of the 2010 garden season, we managed to have success with our tomatoes this year. The initial ripening was a good two weeks later than last year and we still have a large number of greenies on the vine, but we have been enjoying mouth watering cherry-toms and early girls for several weeks now. Sun Gold Cherry: A consistent star in our book. These are the sweetest, most prolific golden gems you’ll ever pop in your mouth! Black Cherry: Dark purplish-red to reddish brown-green fruit with a sweet, meaty flavor. Extremely prolific vine. Juliet: A Roma type cherry with loads and loads of fruit. This one ripened first and is still pumping out the goods. These three mixed together with a little olive oil…summer heaven on a salad plate! We also have several varieties of Roma tomatoes coming on. The Saucy’s are loaded and ready to pick, the Roma’s (those that I managed to save from the failed seed starts) are almost ready as are the San Marzano’s. We grow mostly Roma types because Hal loves to cook with “homegrown” tomatoes all winter and these are the best for cooking. Here is a super simple recipe for enjoying the bounty. Wash and slice Roma’s in half from stem end. In a large bowl toss tomato halves with olive oil to coat; 1/2 cup (or more) chopped basil, generous sprinkling of kosher salt and fresh cracked pepper. I’ve also substituted fresh rosemary and cilantro for the basil – yum! Place tomatos cut side down on a hot grill and grill for about 2 minutes. Using tongs, turn over and grill another minute or so. You want the tomatoes to maintain their shape (not be cooked till mushy). Remove from grill, back into the bowl you used to toss them in. The cooking time is pretty short so don’t wander back to the garden (experience speaking here!!). Let cool in bowl 10 – 15 minutes, then spoon into good quality freezer bags, about 1/2 to 3/4 full. Squeeze out air, lay flat in freezer. That’s it! Depending on your family or serving size you can use the entire frozen block or break off what you need. We don’t skin the tomatoes before grilling, so there are some skins, but these aren’t a problem for us. The tomatoes are great added to soups, stews and pasta. Really easy, really delicious! How do you preserve your summer bounty of tomatoes? Hi Candace! I live in Hayden and somehow manage to have an abundance of tomatoes this year as well! Thanks for the recipe! I just did about 15 pounds of roma's this week -it was maddness on the grill! I'm hopping the warmer temps forcasted for this weekend help get the rest ripe. Thanks for reading and sharing with me. Hi – Clair here from Harrison. I have an abundance of tomatoes all in containers on my back deck. I have never grown ANYTHING before and am feeling p-r-e-t-t-y pleased with myself I must say LOL! Hi Clair, Congrats on tomatoes! And, I know exactly how you feel about "thinning!" I wasn't able to toss my puny tomato starts, wanting to give them all a chance. Really, it is best to thin out for a bigger and healthier crop. 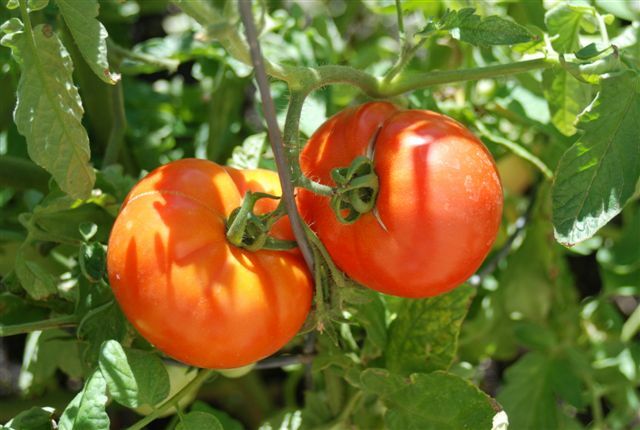 As for the tomatoes – the plants will start to wither on their own, but if frost is forcasted you can cover the plants or pick the greenies and ripen in a sunny window! Thanks for reading and your comments!